The Celtics travel to Toronto to take on the Toronto Raptors for the second time in the last 5 days. This is the 4th and final game between these two teams in the regular season. The Celtics lead the series 2-1 so far with each team winning on their home court. Needless to say, this game is very important for both teams. The Celtics won 6 straight before losing to the Bucks on Tuesday night and are 7-3 in their last 10 games and they are 28-10 on the road. The Raptors have lost 2 straight and are 5-5 in their last 10 games. 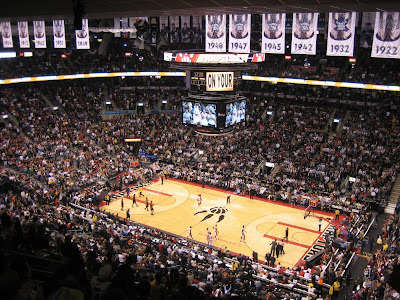 The Raptors have the second best home record in the league with a 31-7 home record. It's a tough task to go into the Air Canada Centre and get a win and the Celtics have to try to do it very short handed. The Raptors are playing in the second of back to back games after losing in Cleveland on Tuesday night. The Celtics will also be playing in back to back games after losing in Milwaukee the on Tuesday night. Both teams have to travel after Tuesday's game. The Celtics are 8-4 on the second night of back to back games and they are 4-1 when both games are on the road. The Raptors are 7-5 on the second night of back to backs and 1-1 when they are road/home. The Celtics are still 2nd in the East, 2 games behind these Toronto Raptors. The Cavs are 5.5 games back in 3rd with no chance to move up into 2nd place. The Celtics still have a chance to move up to #1 if they can get a win in this game. Miami, Washington, and Milwaukee are tied for the 6-8 seeds. Currently Washington is in 7th and would be the Celtics opponent if the season were to end now. Milwaukee is in 8th and Miami is 6th. Marcus Smart (thumb), Kyrie Irving (knee), Daniel Theis (knee), and Gordon Hayward (ankle) are all still out as expected. Shane Larkin spent a couple of days in the hospital with the flu and is questionable. He missed Tuesday's game against the Bucks and it is possible he may travel to Toronto for this game if he is feeling better. Terry Rozier missed Monday's practice with a tweaked ankle and had said that he planned to play against the Bucks but was ruled out against them. My guess is that he will play in this one. If Rozier can't play, Kadeem Allen will probably start again but who knows at this point. The Raptors have no injuries to report as I write this. DeRozan is the Raptors best player and he is averaging 23.3 points, 3.9 rebounds, 5.2 assists, and 1.1 steals per game. He is averaging 19.5 points per game in the three games against Boston so far this season. Jaylen will need to play lock down defense to keep DeMar from having a big game. Lowry has given the Celtics problems in the past and so they need to pay particular attention to slowing him down. He is averaging 16.6 points, 5.6 rebounds, 6.8 assists and 1.1 steals. He averaged 21.0 points in the three games against Boston so far this season. I'm thinking positive and hoping that Rozier will play in this one and that he was sitting out against the Bucks so that he would be ready for this game. Rozier will need to play Lowry tough on both ends of the court. The Raptors' bench leads the league with 45.1 points per game. They are at full strength and have played very strong this season. CJ Miles scored 20 points against the Celtics in their 2nd meeting but was held to just 3 points in Saturday's game. The Celtics also held their bench to just 20 points in spite of having so many injuries to deplete their bench. The Celtics have to step up and play tough against the Raptors second unit once again if they hope to get a win in this game. Defense has always been and always will be the key to winning. The Celtics have the best defensive rating in the league at 101.2. The Raptors are 5th with a defensive rating of 103.6. They need to play particularly tough defense against the Raptors since they are averaging 112.5 points per game and are capable of putting up a lot of points in a hurry. 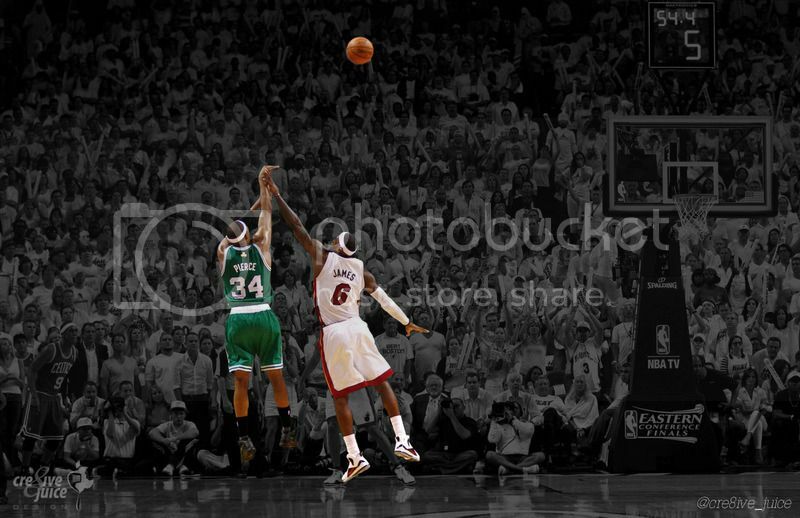 If the Celtics win this game, it will be with defense. The Celtics must be the more aggressive team. They have to be aggressive on defense, in going after loose balls, in crashing the boards, and just all around going all out. They have to aggressively attack the basket. They need to start the game with that aggressive attitude and be aggressive through the whole game with no let up. Their only hope to win because of their injuries is for every player to play their hardest and to play harder than the Raptors. The Celtics must crash the boards. They can't score if they don't have the ball. Much of rebounding is effort and desire and the Celtics have to be the team that puts out more effort from every player to go after rebounds. 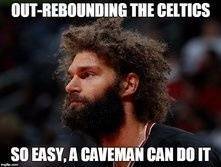 The Celtics are 8th in rebounding at 44.4 per game. The Raptors are 17th with 43.6 per game. The Celtics have to crash the boards and beat the Raptors to the rebounds if they want to get a win. The Celtics have been finding ways to win even without key players. They have been missing 6 of their top players and yet have won 6 straight with 4 of those on the road. This will be the toughest game yet and every player will have to step up once again for the Celtics to have a chance at a win in this one. Revenge Factor - The Raptors are still stinging from the loss to the Celtics on Saturday. They thought they would get an easy win against a depleted Celtics team but were surprised by the Celtics feisty play and never give up attitude. The Raptors also lost to the Cavs on Tuesday and will want to get back to winning after that loss as well. The Raptors are going to come into this game looking to get even and so the Celtics need to be ready to face the Raptors A game in this one. Injuries - I'm hoping that Terry Rozier will be playing in this game and if he can't that will make this game very, very difficult to win. But even if he does, the Celtics are still very short handed and the young players and rookies will need to step up once again. The Raptors are at full strength and that makes the Celtics job even harder. Fatigue - Both teams are playing in the second of back to back games and both teams had to travel after Tuesday's game. The Raptors have a full bench and so have more fresh bodies they can throw at the Celtics while the Celtics are so short handed they have to play just about everybody big minutes. Hopefully the Celtics youth will give them a slight advantage. TP to SparzWizard for being the first to post in the game thread!! Big game. Playoff tune up? Go Celtics. First place still in sight!! It would be very something if the Raptors lose back2back home games these next two games. Let's try to pull a win and make the Raptors sweat. Go time. This is it. Sorry to nitpick, but Nigel Hayes is in Sacramento, now. Just so you know, and TP for all of your great work, as always . Also, if Rozier outplays Lowry, again, well, LOL . Is Rozier coming back? We need this game for flexibility in the standings. Here we go Celtics, here we go. After the loss last night, Cs basically need to win out to have any shot at #1 seed. I find that unlikely. I would not be opposed to just managing people's minutes/days off in preparation for the playoffs at this point and try and get the remaining survivors on this roster rested up and as healthy as possible. I give us no chance without TR. If he sits again, consider it a white flag from BS.